During his show on Panama, Anthony Bourdain observed that Chinese food somehow gets shinier the further west one goes. He might also have mentioned that it changes in other ways throughout the western hemisphere too, on the whole, becoming less and less Chinese-like. In a similar way to Panama, to which Chinese laborers flocked to help build the eponymous canal, Peru experienced large-scale immigration of Cantonese mine workers during the latter half of the 19th century too, and still has the largest Asian population of any nation in South America. Largely isolated from its home country for the intervening century and a half, the Peruvian Chinese community, like many New World immigrant groups, developed its own distinct peculiarities. Regular readers of this blog will know of our penchant for the immigrant groups of the Americas, where they came from, how and why they arrived, and how they went about creating their new and entirely unique cultures on foreign soils, often in the teeth of vicious discrimination from those who had arrived earlier. So it was for the Chinese in Peru. Principally from the Chinese province of Guangdong, these immigrants were not just coming for a short time to work, earn a living, and then return home. In a way that is almost unimaginable for us today, given the global mobility many of us have, those who journeyed to South America to work in its silver, copper and silicate mines had to virtually abandon any thought of ever seeing their homes again. It must have been all the harder without any of the comforts of home either – as traditional Cantonese ingredients were (mostly) unavailable in 19th-century Peru. Culinarily, this isolation and a lack of familiar foodstuffs led to the development of an entirely Peruvian-Chinese phenomenon known as Chifa. Derived from a local corruption of the Mandarin “chi fan” or “eat rice”, chifa cuisine is characterized by somewhat curious ingredient pairings. 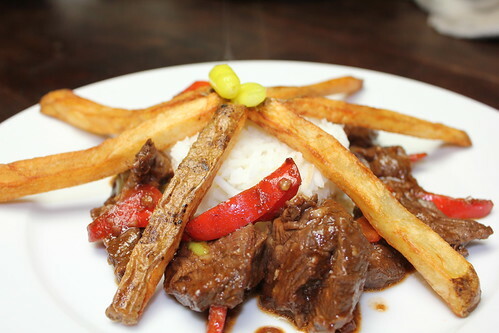 In the most popular chifa dish, lomo saltado – a beef stir-fry, this manifests itself in the carbohydrate combo of rice and french fries, and the flavoring mix of soy sauce, red wine and spicy Peruvian yellow aji peppers. Purists may quibble that chifa is less fusion cuisine and more mish-mash food given the apparent clumsy pairing of local meat and potatoes with Cantonese stir-fry, but I, for one, find that lomo saltado actually offers the same salty, spicy, sour and sweet tastes typical of Chinese cooking, just with different ingredients. Understandably popular among hard-working Cantonese miners, chifa cuisine was also a surprise hit among the higher echelons of Peruvian society, and though initially limited to Lima’s Barrios Altos, chifa restaurants soon began to spring up outside of Chinese neighborhoods too, eventually expanding across the capital (where there are now more than 6,000 chifa restaurants) to most parts of the country. Indeed, so popular has it become that today one can find Chifas, as they’re known, throughout the rest of South America. From Argentina and Chile all the way north to Venezuela, chifa cuisine is almost as well known as Peru’s other great gastronomic export, ceviche. Evidently, this trend is growing among the Yanquis too: Chef Jose Garces of Iron Chef America fame, opened a chifa-style eatery in Philadelphia recently, naming it, rather unimaginatively, Chifa. On a visit to Argentina, Anthony Bourdain commented that the common Porteno carb combo of pizza and chickpea faina must have been invented by drunk people, and rice with fries would seem to fall into the same category. Sure, double starch is weird, but that doesn’t mean to say it’s not good, drunk or sober. Boil rice until cooked, drain and allow to steam. Fry potato batons in oil until crispy and golden brown. Drain and keep warm in oven. Drain steak but reserve marinade. Heat wok or frying pan to high, add 1 tablespoon oil. Add red peppers and cook for two minutes. Add steak. Cook for two more minutes before adding garlic. Cook, stirring frequently, for another minute before adding tomato puree. Stir together well before adding marinade, soy sauce and vinegar. Cook for another minute, stirring regularly, until sauce has thickened and reduced slightly. Stir in aji peppers. Taste and correct seasoning (it shouldn’t need any salt, but you never know. Plate rice, french fries and beef stir-fry. Garnish with cilantro and, if you’re feeling brave, more aji peppers. It wasn’t until I moved to Argentina that I realized how much of an impact the Chinese have had in other parts of Latin America. I haven’t tried chifa cuisine, but I did see it on the menu recently at a Peruvian restaurant in Buenos Aires. Sadly, Argentines’ appreciation for Chinese and other ethnic cuisines doesn’t extend much beyond the capital. Where I live, five hours south of Buenos Aires, there isn’t a single ethnic restaurant, which is why your recipe is particularly welcomed! I have access to all the ingredients minus the Peruvian hot peppers (I’ll substitute some other chiles from the veggie patch). Thanks for the tip about Chifa (the restaurant) too! I’ll have to let family members back home in Philly in on the secret. Kinda makes the society of Bladerunner make sense, these melting pots combining cuisines and making them into hybrids. Love the combinations of flavors in this mix… leave it to bourdain to find miner’s gold… and we eat buns with fries every time we do burgers… what’s the dif with fries and rice??? @Katie – the more research I did, the more Chinese communities I found out about across the world. It’s remarkable the way many of them evolved. Make sure to add a little extra vinegar to your lomo if using fresh peppers as aji peppers usually come pickled (and they’re pretty spicy too!). @Deana – love the Bladerunner reference! I hadn’t thought of that, but you’re totally right. Also, great point about the double carbs in the classic American meal. I’m totally ok with rice and fries when it looks this good. You know what – I was gonna do a hybrid of my own by recreating a typical cha chaan teng (Hong Kong western-style cafe) menu with Southern US dishes. Like the reverse of Americanized Chinese food. But since Foodbuzz rejected my proposal, I will probably procrastinate for awhile. If you wrapped this whole thing in a tortilla with a ton of cheese and then battered and fried it, you might just have something that Real Americans would embrace. @Peter – I’m surprised you haven’t heard about Taco Bell’s latest new heart-stopper, the “beef and nacho cheese tor-chifa”. @Heather – you should team up with Peter and some evil food scientists to create exactly that, except make sure to add lots of synthetic preservatives, coloring and flavors so it will sell well over this side of the Pacific. Ah, the double starch conundrum. You come across it a lot in Latino cuisine. While I would never think to make it at home (perish the thought), I’ve been known to relish it in restaurants. The chino-latino connection really works. Great cross-cultural dish. I’ll take this double starch combo any time … in fact, it’s not that strange: in Greece they stuff fries into souvlaki and gyro sandwiches; skordalia is a potato/bread dip that we slather on hunks of crusty bread (go figure) and when we make Gemista, vegetables stuffed with rice, we roast and serve potatoes alongside! Thanks for the great recipe! I’ve been to Chifa (the Garces restaurant) and had a really great meal with a really iffy dessert. So you know, rice pudding ice cream just doesn’t work, especially when floated in root beer. Also, I saw the baby in flickr. So cute! 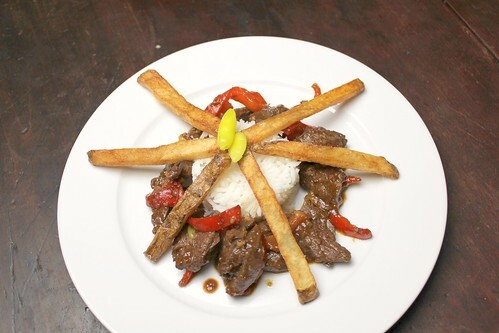 This is one of many dishes they serve over french fries or fried yucca in Peru. This is their comfort food. Chifa in Philly is awesome by the way. A bit pricey but Jose Garces does the style amazingly. You won’t be disappointed. I always think of lomo saltado when I think of Peruvian cuisine, but I never really considered how it too would have that same Chinese influence (the french fries threw me off I guess). Next time I go to Hector’s El Peruano, I should order it and really concentrate on the flavors. Great dish! We are wild about Peruvian cuisine. We saw Tony in person last Friday night at the Cerritos Performing Arts Center, he was a riot! ese lomo saltado de lomo no tiene nada, es una pena que con el afan de modernizar los platos pierdan por completo la identidad de estos. tal vez usted no entiende Inglés , porque este post era todo acerca de las raíces históricas y culturales del plato. el forro fue diseñado para ser caprichoso y moderno no es auténtico .